Dr Theodore Nicholas ran the High Cycle Fatigue Program for the US Air Force between 1995 and 2003 at Wright-Patterson Air Force Base, and is one of the world’s leading authorities on the subject, having authored over 250 papers in leading archival journals and books. 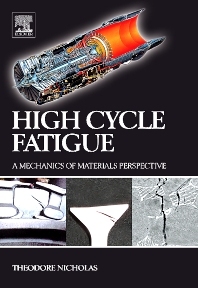 Bringing his plethora of expertise to this book, Dr Nicholas discusses the subject of high cycle fatigue (HCF) from an engineering viewpoint in response to a series of HCF failures in the USAF and the concurrent realization that HCF failures in general were taking place universally in both civilian and military engines. Mechanical engineers, researchers involved in tribology, scientists and students researching into fatigue.